This a travel guide to our Sound World – listing places where what you hear is an important part of the experience. I’m very interested in suggestions for possible places with interesting sounds and other acoustic phenomena. Find places either via this list of all sites, via a search or click on the Tag Cloud. 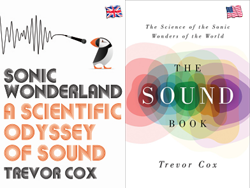 Sonic Wonders is authored by Trevor Cox, Professor of Acoustic Engineering at the University of Salford. The site has inspired the book Sonic Wonderland (UK) / The Sound Book (US).